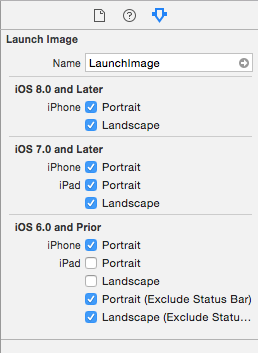 Xcode 6 GM now includes simulators for iPhone 6 and 6 Plus, and by default they run apps in a scaled mode. To enable the new screen size I tried adding Default-667h@2x.png which seems to do a part of the trick since the app now fails to run at all, with the error "Unable to run app in Simulator – An error was encountered while running (Domain = LaunchServicesError, Code = 0)". Has anyone figured out how to get an app actually run in the 6/6+ resolution? You can add a launch screen file that appears to work for multiple screen sizes. I just added the MainStoryboard as a launch screen file and that stopped the app from scaling. I think I will need to add a permanent launch screen later, but that got the native resolution up and working quickly. 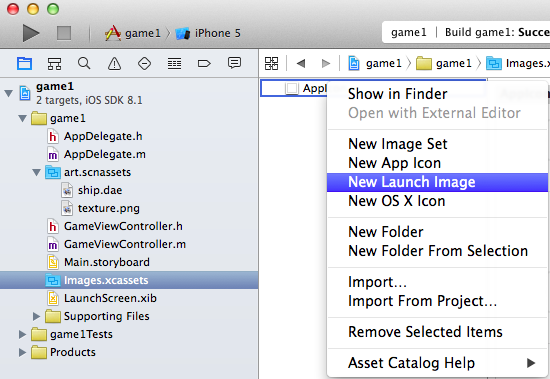 In Xcode, go to your target, general and add the launch screen file there. If you are using asset catalogs, go to the LaunchImages asset catalog and add the new launch images for the two new iPhones. You may need to right-click and choose "Add New Launch Image" to see a place to add the new images. The iPhone 6 (Retina HD 4.7) requires a portrait launch image of 750 x 1334. The iPhone 6 Plus (Retina HD 5.5) requires both portrait and landscape images sized as 1242 x 2208 and 2208 x 1242 respectively. I didn't want to introduce an asset catalog. Note that iPhone 6 will use the 320pt (640px) resolution if you have enabled the 'Display Zoom' in iPhone > Settings > Display & Brightness > View. right-click and choose "Add New Launch Image"
Usually this indicates that installd returned an error during the install process (bad resources or similar). Unfortunately, Xcode does not display the actual underlying error (feel free to file dupes of this known bug). You should check ~/Library/Logs/CoreSimulator/CoreSimulator.log which will log the underlying error for you. If you are using asset catalog, and have multiple targets both using same asset catalog file, be sure that this file has checked both targets in the right panel in xcode. Not the answer you're looking for? Browse other questions tagged ios ios8 ios-simulator xcode6 iphone-6 or ask your own question. Simulator running in scaling mode for iPhone 6 Plus? How to disable iPhone 6 native resolution? How to handle image scale on all the available iPhone resolutions?